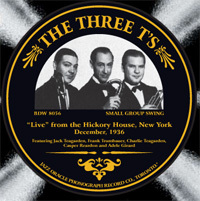 Rare broadcast performances featuring Frank Trumbauer, Jack Teagarden and Charlie Teagarden. At the time, all three were part of the Paul Whiteman orchestra; these club recordings present them in a small group swing setting. The detailed liner notes are by Teagarden specialist Joe Showler. Charlie Teagarden (t), Jack Teagarden (tb,v), Frank Trumbauer (Cm,v), Herman Crone (p), Casper Reardon (harp), Min Leibrook (sb), Stan King (d). Personnel as above, except Adele Girard (harp) replaces Reardon. Charlie Teagarden (t), Jack Teagarden (tb,v), Frank Trumbauer (Cm,v), Herman Crone (p), Adele Girard (harp,v), Min Leibrook (sb), Stan King (d). Frank Trumbauer is the announcer on this broadcast after being introduced during the Opening.